Task in Targetprocess is one of the entity types in the data model. Tasks are the smallest increments of work. Task is a small chunk of work, typically less than 16 hours. Tasks are technical steps that are taken to complete and deliver the user story. While a user story usually delivers some value to an end-user, same doesn't happen with tasks. 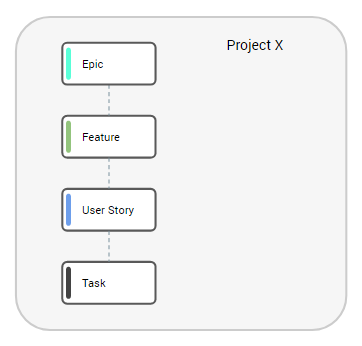 In Targetprocess tasks cannot exist outside user stories. We recommend to split a user story into several tasks when the story is quite large and should be implemented by two or more people or teams. Tasks are denoted by dark blue color. Task always belongs to a single User Story. It is listed in User Story field in Info panel. Tasks cannot exist on their own. Task always belongs to a single Project. Parent Project of the User Story is automatically inherited by a Task. Parent Program of the Project is automatically inherited as well. Task may belong to single Iteration. Iteration is automatically inherited from the parent User Story. Task may belong to single Team Iteration. It is listed in Team Iteration field in Info panel. Team Iteration of the parent User Story may differ from Team Iteration of its Task. Tasks do not have direct relations to Bugs. Effort of Tasks is always measured in Ideal Hours. Tasks cannot be estimated in points. In processes using Ideal Hours as Effort estimation unit total Effort of a User Story always includes total Effort of its Tasks. Total time spent of a User Story always includes total time spent on its Tasks. How is Progress calculated for work items?